If your last-minute fall chores have you climbing a ladder, here are some tips to save time and stay safe up there. Make sure your ladder is rated for the load you plan to put on it, and inspect it carefully for damage before you use it. 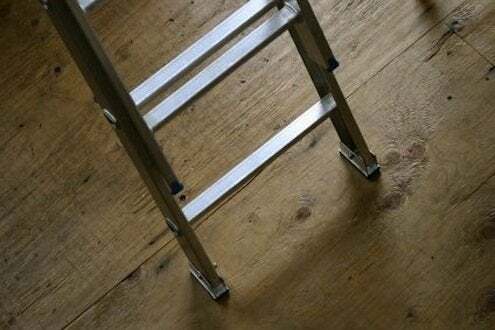 Ideally you’ll have someone to help you, but if you’re on your own, carry your ladder the right way to avoid injuring yourself or causing damage. Hold it upright against your body. With one hand, hold a rung about thigh level. Use your other hand to hold a rung about head height on the opposite side. Set the ladder’s feet on a firm, level surface and slowly lower it into position. To determine how far away you should be, measure the distance your ladder is spanning and divide that by four. That’s how far the feet of the ladder should be from the house. If you’re headed for the roof, you need at least three feet of ladder to extend above the roof’s edge. It’s always a good idea to have someone “foot” the ladder at the bottom, at least while you get situated.